Irwin debuts with movingly rendered literary fiction about love and loss, youth and maturity, ambition and its cost. Rob Carrey is a champion. He’s won prizes propelling a single-seat racing scull with two oars. Carrey’s been recruited for a "post-graduate" high school year by the Fenton School, a posh private Connecticut academy. Carrey, a working-class boy, is alien among legacy children and intends to continue his quest for solitary medals. Instead, he’s drafted to fill a slot in the four-man racing crew. His father’s ambition is that the Fenton sojourn will earn his son entrance to an elite university. There is a second narrative thread with Carrey, in his 30s, no college degree, turned documentary filmmaker. He’s in love with Carolyn, a film editor. Carolyn was once pregnant with Carrey’s child, a baby miscarried while he filmed in Africa. Left shattered by Carrey's response, Carolyn wants to end their relationship just as Carrey confronts the suicide of one of his former racing crew. The narrative segment following young Carrey’s Fenton year is a powerful study of the muddled, stumbling steps from youth into adulthood, a time when Carrey learns "You will lose things....When you do, there will be no river to run to." 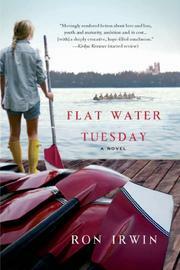 Other characters shine: Connor, best of the Fenton rowers, scion of wealth, never able to fulfill his family’s ambitions, beautiful and damned in the fashion of a Hemingway hero; Ruth, coxswain, first female to drive the boat, petite, ambitious, focused, yet another boarding-school–rich-family throwaway. Irwin’s descriptions are observant and intimate—"as if the boat had found some kind of grace, like a giant bird expanding its wings." Readers become immersed in the Darwinian cruelty of the young reflected against the loneliness of a lost, jaded teacher, then confront a man finding purpose, and close the book after bathing in a deeply evocative, hope-filled conclusion. An elegy to love and loss and reconciliation.